May is mental health awareness month, and I thought I’d post something about this book I read a while back, because I think that pointing people to resources is also a way to raise awareness. 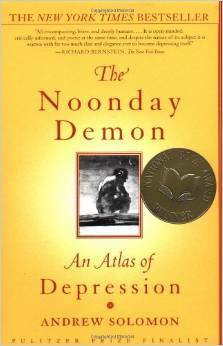 This is a book about depression, and it covers pretty much everything on the topic you might want to know, find out, debate or are simply curious about. So yesterday I went to my first yoga class, which didn’t go that bad considering I’m so out of shape. The last thing we did were some relaxation exercises, and at some point we were asked to visualize in detail something we wished happened and became a reality in our lives. Well, I didn’t exactly visualize anything as in to form an elaborate mental image of something. On hearing that, my mind just simply flashed me an image. To which I instantly broke out sobbing. So long relaxation, so long breathing technique, so long concentration, so long dignity. There’s still so much work to do before I’m emotionally ok. I’ll just have to go on trying. 1. Medicine The inability of a bodily organ or system, especially the circulatory system, to maintain adequate physiological function inthe presence of disease. 2. Psychology The inability to maintain defense mechanisms in response to stress, resulting in personality disturbance or psychological imbalance. Decompensated in the psychological sense of the word – that’s how I’ve been feeling this past month. This could be due to several different reasons, maybe to bits of all of them together, and I’ll never really know for sure. I suspect stresses from work may have something to do with it. But I also suspect that having gone off of antidepressants is also playing a part. A big part. Someone pointed out to me that, although I discontinued fluoxetine according to my psychiatrist’s treatment plan, that treatment plan was designed assuming I was quitting fluoxetine while starting paroxetine, which I never did. So technically I can still be on a rebound, with all the chemicals in my brain doing the polka and the can-can. For the past month, my sleep has been a total mess. I either spend the entire night waking up, tossing, turning and falling asleep again, or I wake up early and don’t go back to sleep, or I go to bed late because I don’t feel sleepy and then getting up the next morning is almost impossible. Sometimes, despite this lack of a stable sleeping pattern, I don’t feel tired. Oddly enough, sometimes I feel energized. Like I’m anxiety-fueled and a time bomb ready to go off. Concentrating on anything has been a real challenge. I need to finish my college paper, and, really, all that’s left to do by now is write two closing paragraphs, put together the bibliographical references and come up with a nice cover. How hard can that be? Apparently, very hard. I can’t focus. All I want to do is finish the paper so I can move on to other projects piling up in the back of my mind, but somehow time is flying and I don’t really know where it’s going. And finally, the mood swings. Mood roller-coasters. I’m running a full gamut of emotions every day, sometimes in just a couple of hours I can go from sad and despaired to confident and empowered, from nostalgic and lost to euphoric and foolish. But this is where it gets interesting – and dangerous. If this description sounds like a nightmare to you, it doesn’t feel like a nightmare to me. If anything, it feels like coming home. This person that doesn’t know a good night’s sleep and that is incredibly moody and sensitive is the person I’ve always known myself to be. These past four years on antidepressants were like trying to be someone that I’m definitely not. They stabilized lots of parts of me, yes, but they also made me more numb. And a heart beating doesn’t translate into a flat line. The thing I’m most angry about, though, is that I feel all this was for nothing. I’m not healthier because I’ve been taking all these meds. My relationships weren’t more functional because I’ve been taking all these meds. I don’t see much results. I tried to be a version of me that I believed, based on what people told me, that would be more acceptable, healthier, saner, more functional, better for me. Yet, people kept telling me I can’t be the way I am. By people I mean specifically family and ex-boyfriends. No matter how much I tried, how much I sought help, no one really gave me a break. I was still too intense, too dramatic, too high maintenance, too preoccupied. So I’m giving myself a break. All my life I’ve been hearing I can’t be the way I am. “You’re too shy, you can’t be that way or you’ll never get anywhere in life.” “You’re too slim, you need to put some weight on.” “You’re too hard on yourself, that’s bad for you.” “You’re too rational, you need to express your emotions.” “You’re too emotional, you need to sober up or no one will put up with you.” Now I don’t need pills to tell me who I should be as well. So what if I’m all that? These are just characteristics. Depending on the context, they can actually be assets. It’s really no use for me to know a lot about mood disorders, family backgrounds, all kinds of therapies or even MS if I don’t know my own soul. Sometimes you have to go back to take a leap forward. And right now, it feels really good to revisit that place, that person who wasn’t afraid that making mistakes might put her in a wheelchair.